By January 1944, however, pain had recurred and the patient was again confined to bed most of the time. X ray studies showed metastatic involvement in practically every thoracic vertebrae, especially marked in the fourth, fifth, eighth and twelfth. All the lumbar vertebrae were involved, especially the first, fourth and fifth bodies and transverse processes. Deposits were present throughout the sacrum, in both iliae, the right ischium, left acetabulum and upper femurs. Another series of deep X ray treatments was used on the same areas of the spine and posterior pelvis as before, the total dose this time being 2000 r., using the same factors. There was again relief of pain, although the patient was kept in bed and a body brace was applied to reduce pain associated with motion and to avoid fracture. Fig. 170. 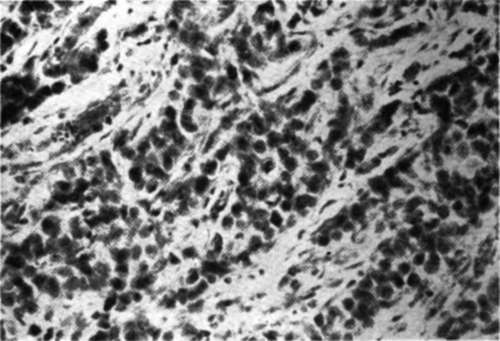 Photomicrograph of recurrent skin nodule in Case E.M., showing adenocarcinoma, Gr III (400 x). Fig. 171. Anteroposterior views of thoracic spine in Case E.M. at time of admission, showing metastatic involvement of vertebrae. Fig. 172. Lateral view of the thoracic spine in Case E.M. at time of admission, showing metastatic involvement of vertebrae. Fig. 173. 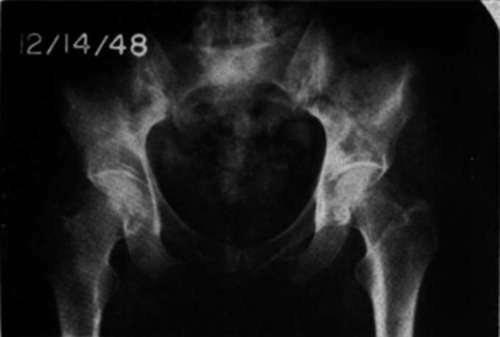 Anteroposterior view of pelvis in Case E.M. showing widespread metastatic involvement in fifth lumbar vertebrae, sacrum, both iliac and femurs, two months after onset of treatment. The patient was hospitalized and treated experimentally from March 8 to December 5, 1944, a total of nine months. The substances employed were n butyl alcohol, cholesterol and glycerin, administered singly and concurrently at different periods. n Butyl alcohol was administered as saturated water or saline solution (7.9%) in doses of from 3 drops every two hours to 20 cc. three times a day by mouth, or from 1 to 5 cc. three times a day. 2.5% cholesterol in neutral oil solution was administered intramuscularly in doses of 1 to 8 cc. three times a day. Glycerin was employed orally in 0.5 to 1 cc. doses three times a day. Dosages of all medication were increased progressively, the aim being to bring about and maintain alkalization of the urine. Clinically, pain was completely relieved after about one month. The patient's appetite improved and she began to gain weight and to feel stronger. After five months, she was mobilized with a brace and showed good progress in the ability to walk. No changes were observed in monthly X ray studies during the first four months of treatment. In the X rays taken in July, the fifth month, at the time of urinary pH change, a few lesions began to show areas of decreased density. These changes progressed fairly rapidly thereafter. Fig. 174. pH of daily morning urine specimens in Case E.M. determined colori metrically, showing changes from acid to alkaline 5 months after the beginning of the treatment. Following her discharge from the hospital, the patient continued to take 0.25 cc. of glycerol three times a day for another six months. All medication was discontinued after that and the patient has received no further treatment since. She returned to her old clerical position and after several years, when the X ray changes appeared to warrant it, the brace was removed. X ray pictures taken fifty seven months after beginning of the experimental treatment, (Figs. 175,176,177) no longer showed osseous pathology and indicated virtually complete restitution of normal appearing bone. The clinical condition was excellent and remained so in 1956, when we saw her. We were indirectly informed that later, in Texas, she suffered a right pleural effusion and died shortly thereafter. M. H.—In February 1948, at the age of 18 months, this patient was admitted to the Good Samaritan Hospital in Dayton, Ohio, because of abdominal pain. An exploratory operation revealed an obstruction caused by a tumor of the bowel that had spread to the lymph nodes throughout the abdomen. A by passing operation was performed to relieve the obstruction. A piece of the mass and some of the involved lymph nodes were removed. The pathological diagnosis was fibro sarcoma. Fig. 175. Anteroposterior views of thoracic spine in Case E.M. fifty seven months after onset of therapy, showing almost complete restitution of normal bone structure. Fig. 176. Lateral view of thoracic spine in Case E.M., fifty seven months after onset of therapy, showing almost complete restitution of normal bone structure. On March 3, 1948, the patient came under our care. At that time, almost a month after surgical intervention, a mass the size of a tangerine was found in the right side of the abdomen. Based upon her analyses, the patient was treated with 1/2 cc. glycerol and 2 cc. of butanol solution three times a day. She continued the same treatment without interruption for two years, gained weight and grew, and no recurrences were noted. It is now 12 years since this little girl started treatment. She is well, attending school, and carrying on all the usual activities of a child of her age. Paralleling these clinical investigations, a study was made of the elimination of surface active substances. This led to the use of surface tension as a criterion for the recognition of offbalance patterns. A series of cases was treated according to this criterion. With the progress of research, new agents also were utilized. Fig. 177. 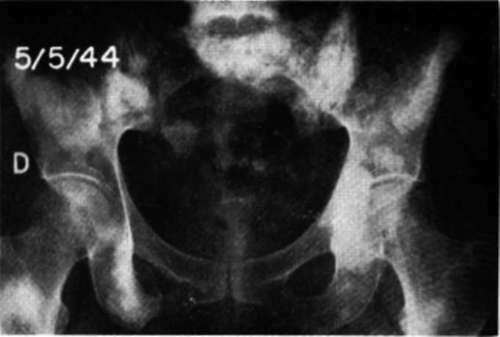 Anteroposterior view of pelvis in Case E.M. fifty seven months after onset of treatment, showing almost complete restitution of bone structure.